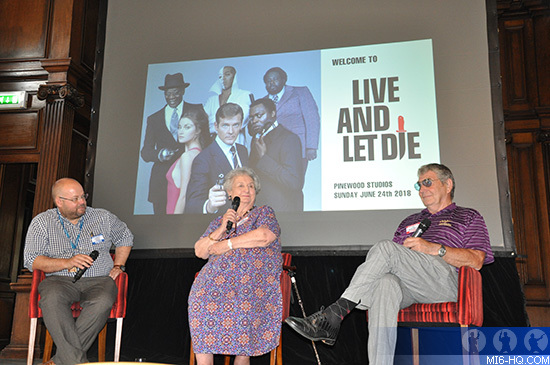 On Sunday 24th June 2018, cast, crew and fans gathered at Pinewood Studios to celebrate the 45th anniversary of Roger Moore’s debut 'Live And Let Die' Hosted by Bondstars the event was headlined by actress Gloria Hendry (Rosie Carver) on one of her rare visits to the UK. Hendry was joined by Madeline Smith (Miss Caruso), Louis St Juste (tribal dancer) and from behind the camera, Art Director Peter Lamont, assistant art director John Fenner, script supervisor Elaine Schreyeck, stuntman Vic Armstrong and SFX alumni Brian Smithies and Ian Wingrove and post-production supervisor Graham Hartstone. The day began with an exclusive screening of Sir Roger Moore’s memorial held at the studios in October 2017. This event was never broadcast and this screening was the first and only time an audience have had the privilege to view this private celebration. The memorial included speeches and tributes from Dame Joan Collins, Sir Michael Caine, David Walliams and Michael G.Wilson. Special guests were on hand for signing and photographs. 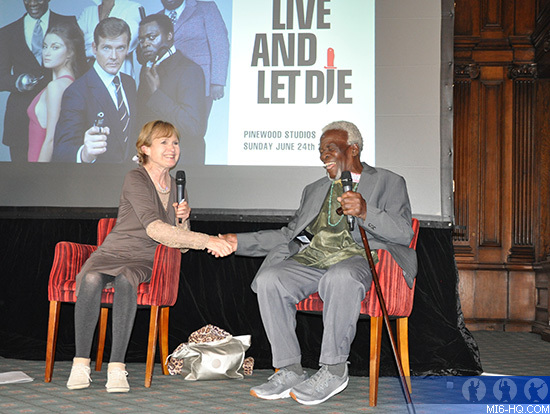 Peter Lamont autographed copies of his Live And Let Die Portfolio – a 100 page special magazine published by MI6, detailing his work on the movie and showcasing many of his own personal documents and photographs. Bond director John Glen also joined later in the day to sign copies of his autobiography 'For My Eyes Only'. Following a tour of the Pinewood gardens by 'The Essential Bond' author Dave Worrall, Gareth Owen hosted a Q&A session. Madeline Smith recalled her scene in which James Bond undresses Miss Caruso with his magnetic watch: “I thought there was one person under my legs but there were apparently two or three.” To Maddie’s delight a shout from the crowd revealed one of them - Ian Wingrove - was in the audience! “Roger brought in the cassette with the demo music for 'Live And Let Die' for us all to listen to. He said ‘Isn’t this wonderful, this is going to be a great big hit,’ which of course it was.” Gloria Hendry discussed how she trail-blazed as the first official black James Bond girl: “I didn’t know anything about Bond films,” she revealed when first meeting producer Harry Saltzman. Elaine Schreyeck remembered: “I nearly didn’t do 'Live And Let Die'. I was reading the script sitting in my garden and I suddenly said to my mother ‘I can’t do this film! I don’t like snakes!” Later she remembered been equally petrified when working on Ross Kananga’s crocodile farm. Star of the show was Louis St Juste who entertained the audience with tales of filming the pre-title and the finale voodoo village scenes at Pinewood Studios. The day culminated with a 4K projection of 'Live And Let Die' in the comfy John Barry Theatre. The screening was introduced by Lamont who recalled that originally the filmmakers wanted to include a water carnival of women during the boat chase which was to have come crashing down as James Bond roars through the middle of it. The scene was to have cut to a golf course near by where a gentleman is about to make a two-inch put, as a boat comes crashing into a sand bunker. The golfer was to have been played by golfing ace and Live And Let Die’s cinematographer, Ted Moore. 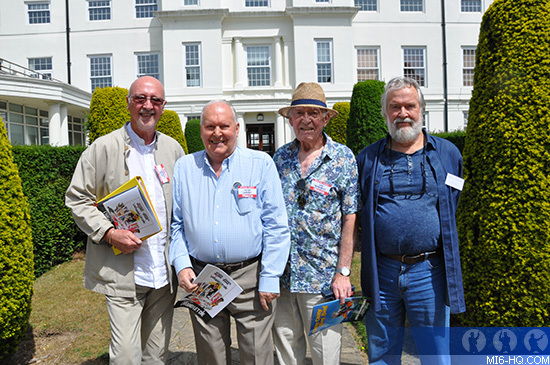 Another enjoyable and memorable event from Bondstars who will return later in the year with a 50th anniversary celebration of Albert R. Broccoli’s 'Chitty Chitty Bang Bang'. Matthew Field is the co-author of Some Kind of Hero: The Remarkable Story of the James Bond Films. He is a regular contributor to both MI6 Confidential and Cinema Retro. He currently serves on the board of directors of The Ian Fleming Foundation.